We perfected the telescopic shaft for our Adjustable Loft Club in 1992. Because it is a 4-iron length and the shape of an iron, it is most like an iron, and the most unlike a driver and putter. Because the Adjustable club isn’t as long as a driver shaft, it can’t generate as much club-head speed, so it doesn’t hit as far. Drivers are the longest and lightest clubs in a bag. Putters are the shortest and heaviest. They are the extremes in terms of length, shape, weight, and purpose. So it is logical that an all-in-one golf club will not do those jobs as well. Because we had already had telescopic shaft technology perfected, we started offering telescopic drivers and putters to our customers who wanted to bomb it off the tee and putt with a conventional feel. Some of those players also wanted the next club in from those extreme lengths and weights, so we added telescopic iron hybrids and wedges. Kenneth at the Guinness Book of Records Longest Course in the World in the shadow of the Himalayas in China which also has the longest par 5 in the World at 711 yards. Kenneth Lie, Singapore: "I've had your Whole-In-One club for several years now, and have added your telescopic driver, putter, wedge, and hybrid...and also gotten your BigStik driver and some clubs for friends. These are amazing clubs. They are well built and very solid. My colleagues are impressed, and they really like the personalization on the Adjustable. My club pro is surprised at how well they hit and that they collapse for travel. I love showing them to friends. Since the Adjustable tucks into a corner of my travel case, I take it with me on all my trips abroad." Just thought I'd let you know I'm at La Quinta golf resort at Palm Springs California playing golf the next 2 days with my telescopic clubs: TF driver, hybrid, adjustable, sand wedge and mallet putter. I play the Greg Norman course tomorrow and the Dunes course Wednesday. Thanks for making great clubs! Kenneth in front of the Pyramids in Giza, Egypt with his Divnick Adjustable. Over the years, we have matched and fitted our telescopic shafts to every head in the bag for players all over the world, including a 30-foot exhibition driver, and clubs with 4 heads for trickshot performers! New this year, "The World's Longest & Largest Production Driver" which has a 5-foot long telescopic shaft and a huge head that is nearly DOUBLE the legal limit. Therefore, it is completely illegal for tournament play, but a riot to hit. It has become a prolific fund-raising club at charity golf outings. You can read more about it at the bottom of this page. Said another way, we can fit our telescopic shafts to whatever heads our customers want. Some customers have even purchased entire 14-club telescopic sets. The most popular telescopic clubs are the Whole-In-One Adjustable, the Tee & Fairway Driver, and the Telescopic-Putter which we offer at a discount as a “Telescopic 3-Club Set” shown here. We are the global supplier of telescopic shafts for all clubs, including installing telescopic shafts on customer's name-brand heads! This page will focus on our telescopic shafts and what makes them so solid, durable, and how they perform so exceptionally. We encourage you to review this page before you look at the pages describing the drivesr, putters, hybrids, wedges and custom options. Shafts: Our telescopic shafts extend and lock based on the engineering of a machinist's taper. It takes more force to unlock the shaft than to lock it. There is absolutely zero movement between the shaft sections when locked. Our shafts are nothing like practice putters with threaded connections or "twist-lock" like ball-retrievers. Those practice shafts might be OK for putting around a hotel room, but they are not suitable for actual play because of the movement in the shaft. When you swing and hit our clubs, you cannot tell the difference between them and a one-piece shaft. See this FAQ to learn more about how the shafts are cut and machined. Note: Our shafts are not adjustable for length. They are either collapsed for travel or storage, or extended for play. Adjusting mechanisms in the middle of shafts would significantly alter the weight, flex, torque, feel, and performance. Of course, you can "adjust" the length like any other club by choking up or down on the grip. Collapsing Cap: Our telescopic shafts include a proprietary machined stainless steel collapsing cap pressed onto the shaft that extends through the end of the grip. It is designed to withstand impact against concrete which is required to disengage the shaft sections. Click here to see the entire collapsing cap. Counter-Weighting: The collapsing cap also serves as a counter-weight, sometimes called back-weighting which makes the club feel lighter. 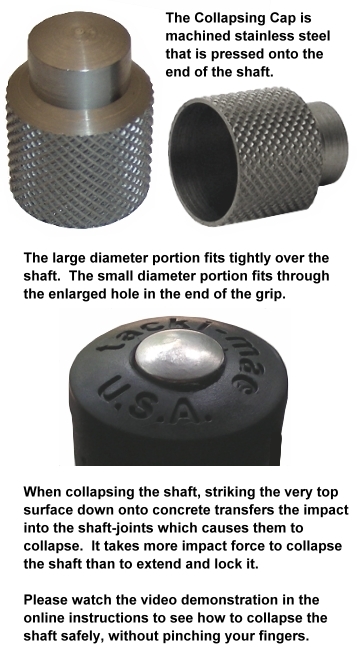 One of the most dramatic improvement methods within custom fitting is the use of a weight inserted into the grip end. This is included FREE with our telescopic clubs. Grips: We ship our clubs with a Tackimac black grip pictured here. These grips never lose their tacky feel and are the most durable grips in the golf industry. If you want a custom grip, you can send us a grip and we will install it on your club at no additional charge. Or, you can remove our grip and install your own at any time. Just drill out the hole in the end of the grip so our collapsing cap can extend through. The bit size will vary a little depending on the type of grip material. We use a 11/32 " bit but recommend you start with a 3/8" if the end of your grip is soft flexible rubber. Note about Putter Grips: We do not use an alignment or flat-side putter grip because it is very difficult to extend the shaft in perfect alignment. Note from Steve Divnick: If you ride a motorcycle and play golf, you are among friends. Until these clubs, it has always been difficult, if not impossible to put these two activities together. Now you can ride your bike to your favorite course, or take a long trip anywhere with a round or two of golf included. You can use the single Whole-In-One Telescopic Adjustable Club, or take our 3-Club Set which includes a Tee & Fairway Driver, the Adjustable for all the iron shots, and a Putter...all telescopic. 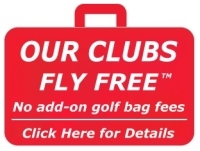 Click here or on the picture to see the best way to fit our telescopic clubs into an airline-checkable travel bag. 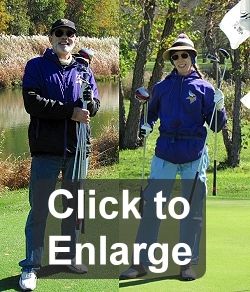 Click here to read about custom telescopic club options. We just got back from our first trip using our new Divnick travel clubs. We flew to Wisconsin and played the "House on the Rock Resort" course. 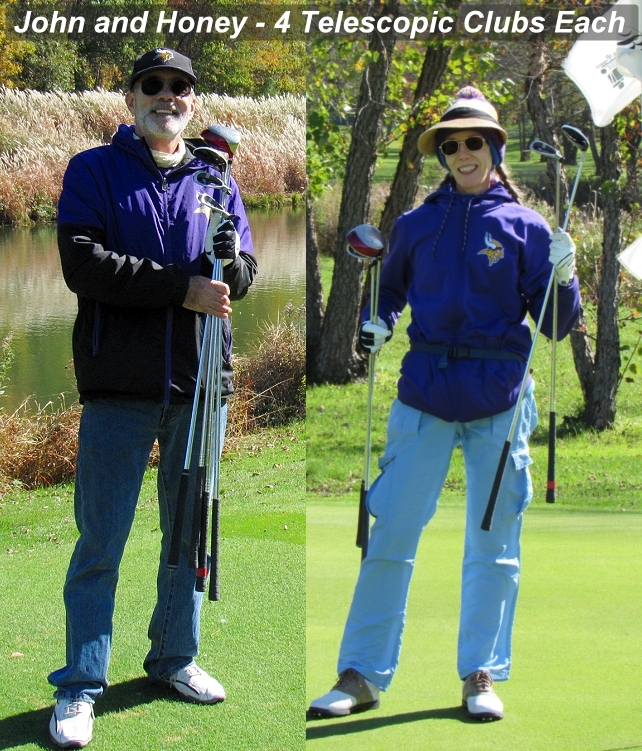 We each loved having only 4 lightweight, telescopic clubs. It was unseasonably cold in the 30's and 40's, so we were pretty bundled up. But we were on vacation, the sun was out, and we had a great time. Everyone in the clubhouse was amazed by our clubs! If you get 2 or more telescopic clubs, you might also want to get a handy lightweight Sunday Bag too. The durable bag has an adjustable shoulder strap, a hand strap, 2 convenient zippered ball and accessory pouches, a mesh pouch, a mid-separator strap that keeps all the clubs from bunching together, and a removable stiffener. With the stiffener in place, it makes the bag easier to carry and holds it open for easy replacement of clubs. 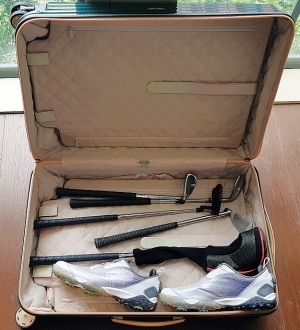 With it removed and the clubs collapsed, the bag can be folded over to fit into your roller bag. It is perfect for carrying the TF-driver, putter, and adjustable club, along with two or three additional clubs if you wish. Cost: These bags normally cost $39.95, but are available in April for $29.95, plus an additional 10% discount if you order 3 or more clubs. Click here to order the bag on our secure order form. When we say "Big Stik" we mean really BIG STIK! It is 5-Feet long and has a massive DOUBLE SIZE head! It can hit the ball out of sight! Of course, it is COMPLETELY ILLEGAL!